I have always been fascinated by tiny things. I love miniatures that work, like tiny flashlights or little tools that are capable of much more than one would expect. I know exactly when that fascination came about (related to a book I much enjoyed as a small boy), and even in the knowing it has never waned. Given a choice, I’ll go for small and compact. One of the things I love about photography is the little surprises. I’m always taking pictures that surprise me in little ways. Often, even when I’ve spent quite a bit of time thinking about a shot, or looking at something from different angles, I’ll look at the image onscreen and see something I hadn’t noticed — a highlight, a reflection, a little detail in the background. These are the little things that keep me fascinated. Another of my photographic fascinations is the tiny, unnoticed things around us. I love photographing the tiny flowers that others pass without noticing, the bugs that others don’t see. Often I get one of the surprises I mentioned in unseen insects. I took the above picture of a sunflower, backlighted by the sun (another favorite thing of mine) on a flying trip through the Nebraska Sand Hills last summer. Jumped out of the Explorer, snapped the shot, and promptly forgot about it. Back home in Florida, when I looked closely while editing, I discovered not one, but four little surprises. Did you see them when you first looked at it? 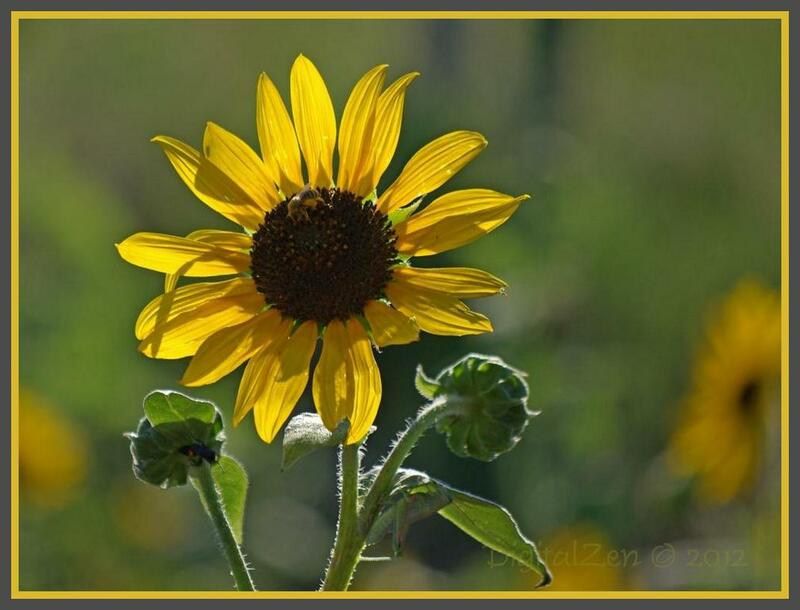 This entry was posted in Critters, Flowers, Photography and tagged Critters, Flowers, Nebraska Sand Hills, Photographic Lighting, Photography, Recreation, Travel on May 3, 2012 by Bill.